The Tosa, also called the Tosa-Inu or Tosa-Ken, is a stately, massive dog. Athletic and surprisingly agile. The head is large, with a broad skull, fairly abrupt stop, and a moderately long, squared-off muzzle. The jaws are very powerful. The skin at the neck forms a dewlap. The ears are fairly small and pendant, falling along the cheeks. The eyes are small, dark and almond-shaped, with a dignified expression. The long tail is very thick at the root then tapers to a point, reaching the hocks. The short-haired coat is dense and harsh. The preferred color is solid red, though black, yellow, black & tan, fawn, brindle and multi-colored is also permissible. Tosa Kens are quiet and reserved inside the home. They are affectionate and friendly with family. They are more aloof with strangers, however, and can be used as an excellent guard dog. They can be dog aggressive, however. They are devoted to their family. Tosas are trainable, excellent fighters, agile and athletic. They are well behaved at home and a protective companion. They are happy to greet friends and family, but suspicious of strangers. They do not like being left alone, and should not be left in a kennel. They bark only when necessary, and are brave and intelligent. 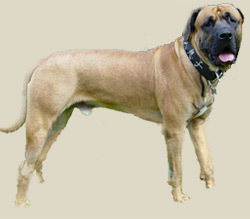 The Tosa are also a patient breed. The Tosa Inu does not require a lot of exercise, only an average amount. If given a yard and a place to roam, they will get all the exercise they need.